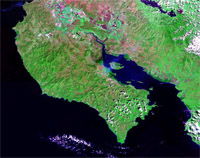 The Nicoya Peninsula is located on the pacific coast in the Guanacaste Province. It's home to many popular venues such as Tamarindo, Santa and Mal Pais. Many national parks and reserves reside on the Nicoya Peninsula including Barra Honda, Marino Las Baulas, Vida Silvestre Curu and Cabo Blanco. You'll find excellent snorkeling and scuba diving in the Gulf of Nicoya along with abundant wildlife on the gulf islands such as Isla Chira. There are numerous resort towns to discover and some of the best surfing and beautiful beaches such as Playa Manzanillo, Playa Samara, Playa Caletas and Playa Guiones.